BLAME IT ON BUSH….. LET’S CONSIDER THAT!!!! 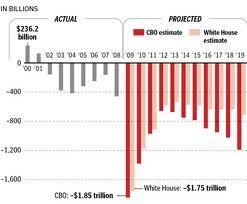 President Obama and the Left like to blame everything on former President Bush, especially the economy and the deficit. Is that a valid criticism? Let’s check a few facts and some time lines and see if it will hold water. Although I will acknowledge that the former President made some decisions that were not good on numerous fronts, this criticism seems to falter under examination regarding the deficit and economy. At the end of his Presidency Mr. Bush received and believed some very bad advice regarding the bailouts. While that is regrettable, it’s history and he did it with the support of Mr. Obama and his fellow members of Congress. So Mr. Obama is complicit in this and can’t just lay it all at the feet of Mr. Bush. “I want to begin by saying that I am glad to consider the legislation, but I do not think we are facing any kind of a crisis. That is, in my view, the two government sponsored enterprises we are talking about here, Fannie Mae and Freddie Mac, are not in a crisis. We have recently had an accounting problem with Freddie Mac that has led to people being dismissed, as appears to be appropriate. I do not think at this point there is a problem with a threat to the Treasury. I must say we have an interesting example of self-fulfilling prophecy. Some of the critics of Fannie Mae and Freddie Mac say that the problem is that the Federal Government is obligated to bail out people who might lose money in connection with them. I do not believe that we have any such obligation. And as I said, it is a self-fulfilling prophecy by some people. So let me make it clear, I am a strong supporter of the role that Fannie Mae and Freddie Mac play in housing, but nobody who invests in them should come looking to me for a nickel–nor anybody else in the Federal Government. And if investors take some comfort and want to lend them a little money and less interest rates, because they like this set of affiliations, good, because housing will benefit. But there is no guarantee, there is no explicit guarantee, there is no implicit guarantee, there is no wink-and-nod guarantee. Invest, and you are on your own. Now, we have got a system that I think has worked very well to help housing. The high cost of housing is one of the great social bombs of this country. I would rank it second to the inadequacy of our health delivery system as a problem that afflicts many, many Americans. We have gotten recent reports about the difficulty here. Fannie Mae and Freddie Mac have played a very useful role in helping make housing more affordable, both in general through leveraging the mortgage market, and in particular, they have a mission that this Congress has given them in return for some of the arrangements which are of some benefit to them to focus on affordable housing, and that is what I am concerned about here. I believe that we, as the Federal Government, have probably done too little rather than too much to push them to meet the goals of affordable housing and to set reasonable goals. I worry frankly that there is a tension here. Wow Barney, there is no problem and no guarantees. The government has done too little to push this housing situation so that people could buy houses they could not afford, no questions asked and you’ve made deals with these institutions and even if there was a problem THE FEDERAL GOVERNMENT WILL NOT BAIL THEM OUT! Wait, you were one of the chief proponents for doing that very thing. You helped create the mess and now you are in charge of fixing it. That sounds like giving the fox the keys to the hen house and telling him to watch the chickens. But let’s go further in 2007 the Democrats took control of Congress. While the President submits his proposed Budget, the U.S. Congress then goes through it to recommend the funding levels for the next fiscal year. Then budget committees set spending limits for the House & Senate committees and for Appropriations subcommittees, which then approve individual appropriations bills to allocate funding to various federal programs. After that is done CONGRESS approves an appropriations bill and sends it to the President for signature or veto. So blame it on Bush doesn’t hold water here either. The Democrats controlled this budgetary process in 2008, 2009, 2010 and for fiscal year 2011. In fact in 2009 – Nancy Pelosi & Harry Reid bypassed George Bush and passed resolutions to keep government running & spending until Obama could take office. They passed a massive omnibus spending bill. Where was Obama? He was a member of the very Congress that passed all these massive spending bills. So who’s deficit is it that he inherited? Not Bush’s! It belongs to him and the rest of his liberal Democrat friends. Yet he continually wants us to believe that everything that has taken place and is taking place and will ever take place that is bad is George W. Bush’s fault. It is time to CLEAN HOUSE in Washington in November and finish the job in 2012. Don’t be surprised if you find that this administration uses tax payer dollars to fund the Mosque near Ground Zero. For America to survive as a Free Nation, a Republic with liberty and justice for all this is the place to begin. We must also put legs on our prayers and as Jesus said concerning His work in John 9, we must work while it is day, night is coming when no man can work. We have come to a time when as Jesus said in the Gospel of Luke, men’s hearts will fail them from fear and the expectation of those things which are coming on the earth. Opposing this administration does not make me a racist. I do not care about the race of the President or any member of Congress, I do care about their policies and politics. Opposing this administration’s policies does not make me a right wing extremist (terrorist) as the left seems to want to paint those like me. I love America and do not want to see her destroyed. I want to walk in the fear of God, protected legally by a Constitution that was designed to keep the government from becoming a Tyranny. I want to continue the freedoms that we have enjoyed for over 200 years and am not willing to go down without speaking out and doing what I can through legal peaceful means to prevent America’s demise. Therefore, I encourage you to keep the flames of Liberty burning. Keep your hearts turned toward God and do everything you can to preserve this Nation. It is true that we, who have been born again through the blood of Jesus Christ, are just passing through. One day we will leave this world for good but while we are here, as citizens of the United States of America, I believe it is our civic, moral and spiritual duty to defend her against all enemies both foreign and domestic!